Well, about that thing I said…. But my friend, colleague, and team member, Gregg Franklin, said if I ever came to the LA area that he would take me to Disneyland. And so – that settled it! I knew I just had to get to CA! So when the opportunity presented itself to throw a speaker app in the mix for WCLAX, I figured what the heck – you never know if you’ll get picked or not! So I submitted the application and really had pretty much forgotten about it. 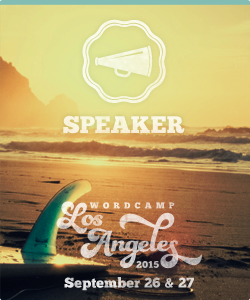 Looks like I’m speaking at WordCamp Los Angeles! The last speaking engagement I had was WordCamp Denver in 2013, and since then I haven’t had time to really devote to WordCamp talks. Public speaking is one of my favorite things to do – so I’m really excited to hop on stage and visit with you all in LA. Because if you know me – you know I go big, or go home! What else should I do while I’m in town? I’ll have 3 days of “playtime” before WordCamp! That is so awesome. I’ll look forward to meeting you and possibly hearing you speak.